In 2014, I attended an LGBTQIA+ police listening forum advertised as an opportunity to bridge communication between law enforcement and the LGBTQIA+ community. I brought along a crew of youth I work with, thinking this could be a great chance for some honest dialogue. As queer youth of color, they were excited to discuss the ways in which law enforcement targets them when they socialize in Philly’s LGBTQIA+ neighborhood. We quickly realized we had come to the wrong meeting. It’s a funny thing, the LGBTQIA+ community’s relationship with the police. One on hand, I’ve witnessed the white LGBTQIA+ community begin to acknowledge that police violence is a big problem – no doubt in response to the incredible energy of the #BlackLivesMatter folks. Many white LGBTQIA+ folks will cite our collective history of heterosexist and cissexist violence as a natural source of solidarity with people of color as they struggle against violence at the hands of the criminal justice system. Some of us leap into this conversation full force – demanding an end to mass incarceration and racialized state violence and incorporating this charge into our daily work. But I can’t help but notice that when things hit a bit too close to home – when the white LGBTQIA+ community perceives a threat to their designated safe spaces – concerns of police violence against people of color (LGBTQIA+ or not) fly out the door. Suspicious person on my block? Call the police. Loud noises around the corner? Call the police. We become swift to call the police “our friends” and incarceration “a practical solution.” This concerns me in a big way. What does it mean when the white LGBTQIA+ community expresses enthusiastic support for a carceral state while simultaneously championing the charge to eliminate racialized police violence and the overstuffing of prisons? We can’t do both, y’all. If genuine social change is your aim, it might be time to slowly pull your hand away from the phone, back away from the officer, and invite your community back to transformative justice. You don’t have to look far into LGBTQIA+ history to realize how radically our priorities have shifted. Historically, the primary threat to the safety of our community wasn’t the general public, but the police. And they had total legal immunity. In California (now widely seen as a leader in LGBTQIA+ legal protections), vagrancy, perversion, and sexual offense laws permitted law enforcement to routinely abuse, detain, and arrest LGBTQIA+ folks. With the full support of the law, systematic violence by police posed the single greatest threat to hubs of LGBTQIA+ life. And so, as a community does when under attack, we organized. In 1962, bar owners in San Francisco created the Tavern Guild (the first gay business association in the United States!) to address police corruption. In 1965, the police watchdog organization Citizens Alert was founded and received 1,700 complaints of police brutality in its first year. Oh, and remember that lil event Stonewall? The spark that ignited the LGBTQIA+ civil rights movement was an uprising against hyperpolicing of LGBTQIA+ establishments (though certainly not the first). We were pushing back on the police. Delegated “safe” LGBTQIA+ neighborhoods didn’t just happen because the police decided they were tired of abusing us. It took decades of agitation – and white privilege. In doing so, some white LGBTQIA+ folks began to gain access to political power and visibility. And with that, access to money. And with money, of course, business and home ownership. Many white LGBTQIA+ folks began to buy homes in the neighborhoods that had long been LGBTQIA+ stomping grounds. So hey, now we have money. And, y’know, I want to keep my money. We’ve got to get tough on crime. Idk, maybe the police should be our friends?!? Frequently, though, this entailed gentrifying neighborhoods (and continues to, but that’s another article). And so years after police had tried to kick us out, we now owned the homes and businesses. And so we invited them in. As white LGBTQIA+ people, resistance of police brutality is in our blood. We were once criminalized. We are born of this resistance. And yet, with police training initiatives, hate crime legislation, trans-affirming police directives, and Gay Officer Action Leagues, ideas of LGBTQIA+ public safety have radically switched gears to create a robust alliance with the criminal justice system. We are systematically folding the criminal justice system into the fabric of our community, and in doing so, cloaking ourselves in the security of white privilege. And despite what our new sense of systemic safety might be telling us, the police didn’t just quit being problematic because they (well, some of them) learned how to respect pronouns. So if police are no longer abusing and arresting white LGBTQIA+ folks, who are they arresting? They are arresting people of color. Low income people of color. Wealthy people of color. Straight people of color. Cis people of color. LGBTQIA+ people of color. “LGBTQIA+ friendliness” does not a justice-oriented police force make. A couple months ago, my roommate and I had a meeting with a local police commander. 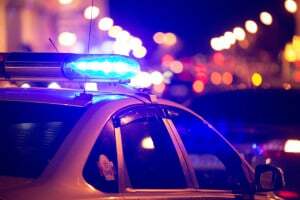 My roommate (a black, gay man) was being routinely profiled, harassed, and threatened by police in our (largely white) neighborhood, with increasing levels of violence by the officers. When they verbally assaulted him and emptied his belongings one night on his way home from work, we went in to talk. Hip to the LGBTQIA+ training undergone by police in my city, and carrying my white privilege, I naively asked the commander if they had offered a similar anti-racism training. I knew they had training on Stop and Frisk policies – surely there was a mention of racial profiling? The commander stared at us blankly and said no. My roommate now takes an alternative route home to avoid passing the station for fear of retribution. As a white queer person, the police offer me safety from harm in my neighborhood. As a black gay man, my roommate isn’t entitled to that. Because the law continues to support police violence against people of color. While Black Code, Jim Crow, and vagrancy laws may not explicitly exist anymore, legislated surveillance of people of color remains robust. From Stop and Frisk to the War on Drugs, people of color are written into law as assumed criminals. Unlike the white LGBTQIA+ community’s successful call for police accountability, police are largely protected in their acts of violence against people of color. License to Kill, No Duty to Protect, Objectively Reasonable – these laws and policies might not have killed Eric Garner and Tamir Rice, but they legally justified the violent white supremacy of the officers who did. These laws and policies aren’t just racist artifacts – they’re alive and well. Peruse the ample evidence showing that the United States criminal justice system, specifically with police as its public arm, disparately harasses, abuses, arrests, incarcerates, and kills people of color, specifically black people. We know this is real. Even if the internalized white supremacy nestled into your heart resists and resists and resists, you empirically cannot disagree this is real. The thing is, police violence isn’t about just a one-dimensional black person. As you likely know by now, one isn’t separately a race, sexual orientation, and gender. Meaning LGBTQIA+ people of color remain starkly impacted by police violence and the criminal justice system. In a study of LGBTQIA+ interactions with law enforcement in New Orleans by the queer and trans youth of color group BreakOUT!, 87% of people of color respondents had been approached by police compared with 33% of white respondents. That same study found that 42% of LGBTQIA+ people of color respondents had called the police for help and then been arrested themselves, compared with zero percent of white respondents. *Unless you define our LGBTQIA+ community as exclusively white, in which case it’d be super helpful if you said so explicitly. Unlike the historic gay ghettos where police only showed up in a raid, police are now a fixture in white LGBTQIA+ neighborhoods. And many LGBTQIA+ people of color move through these “safe spaces” well aware of the continued threat of (legalized) police violence against them. This isn’t just a feeling. It prevents LGBTQIA+ people of color from simply taking up space on sidewalks marked with rainbow flags, from accessing stores and clubs that state they are safe spaces in the window, from feeling like neighborhoods marked safe are actually safe for them. So while white LGBTQIA+ folks continue to build alliances with the criminal justice system, many LGBTQIA+ communities of color hold radically different organizing priorities. Folks across the country are engaging in creative means to resist the rampant police violence in LGBTQIA+ neighborhoods. In New York, the Audre Lorde Project hosts Safe OUTside the System Collective to address street and state violence. Streetwise and Safe, as well as FIERCE, include within member education and organizing training on how to navigate police harassment and abuse in New York City’s gayborhood. In New Orleans, BreakOUT! is working to end the criminalization of LGBTQIA+ youth. The Trans Women of Color Collective regularly makes calls for greater police accountability while INCITE! has created a toolkit for women and trans people of color who have experienced law enforcement violence. The #BlackLivesMatter movement is explicitly and inflexibly intersectional. #BlackLivesMatter means #BlackQueerLivesMatter means #BlackTransLivesMatter. So if reality isn’t compelling enough for white LGBTQIA+ folks to affirm the impact of a criminal justice system grounded in white supremacy on communities of color, consider this: These are our community members. If, as a white LGBTQIA+ person, you’re going to hashtag #BlackLivesMatter on your social media, know that it isn’t just a trend. If you commit yourself to an end to racism in the criminal justice system, you commit to a genuine challenge to yourself – a challenge to emerge from a safe space protected by white supremacy and police. To align our LGBTQIA+ community with social justice that risks our gay dollars. To level a hard critique against a criminal justice system that continues to systematically destruct the lives of our LGBTQIA+ community members of color. For the time being, the criminal justice system is not a source of safety nor healing. 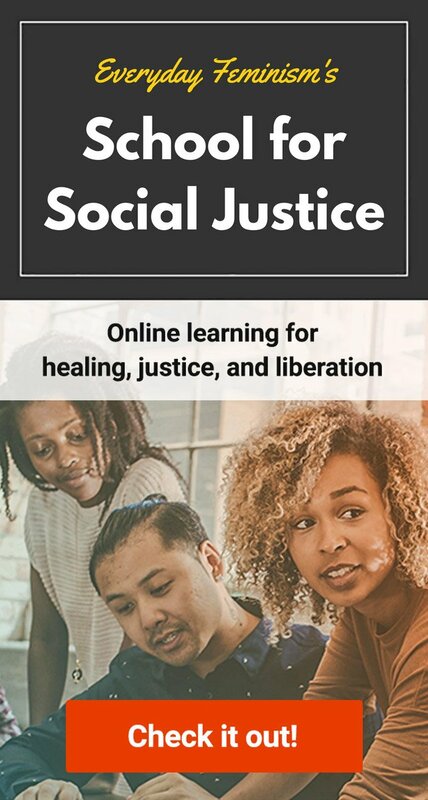 Transformative justice , an alternative to retributive justice, identifies the criminal justice system as a source of violence and resists its involvement in restoring individuals and communities. Instead, transformative justice prioritizes accountability that isn’t only focused on the rehabilitation of the offender, but also the transformation of the context that led someone to harm someone else. Transformative justice calls us all in to healing in its claim that oppression is at the root of all harm. For example: Theft is a product of intergenerational poverty. Assault is a product of trauma. Sexual violence is a product of misogyny. Homophobia is product of our heterosexism. Transphobia is a product of our cissexism. And neither police nor prisons can fix these. In their current state, they assist them. So transformative justice asks us to engage in the rehabilitation of our fractured communities. It asks white LGBTQIA+ folks to incorporate race and racism into our understanding of community safety, to assess the economic accessibility our LGBTQIA+ neighborhoods, and to de-emphasize arrest and incarceration as necessarily useful. Transformative justice isn’t just a principle – it’s a proven practice. It’s specifically gaining lots of steam in the areas of intimate partner violence, sexual violence, and child abuse. The following are some great examples of folks doing justice without the police: INCITE! (check out an amazing conversation they held on Trayvon Martin), Third Eye Collective, Transformative Justice Law Project, Philly Stands Up, and Feminist Care Packages. As LGBTQIA+ folks, we’ve got to stop calling the police in an era when racialized police violence is rampant. We’ve got to remember our history. We’ve got to reconsider who feels safe in safe spaces today, and we’ve got to engage other white LGBTQIA+ folks in considering a justice that heals without harming. I want to do this. I want to keep talking about this. I want to dream up plans and put them into place. Will you join me?